Before I begin, I am using the Anti-Bacterial Moisturizing Hand Soap in Cucumber Melon as my frame of reference for the ingredients list. This is actually one of the gentler ones of the bunch (compared to the Deep Cleansing and Foaming recipes). Germs. They're everywhere. We all know that handwashing is imporant. I wash my hands so many times per day I couldn't even give you an estimate of the number of times I am washing my hands. I have always been a frequent handwasher. I don't like getting sick. No one does. I remember once when I was working for Estee Lauder over at a department store in East View Mall being in the bathroom scrubbing my hands...a makeup artist from another line was in the bathroom and didn't wash her hands. Ten minutes later, she was applying eyeliner to a customer. I think this is why, at times, I can be somewhat of a germophobe, but also why I get so paranoid about cleanliness that I did my own makeup for my wedding--I could never get that image out of my head. Nicholas was born when I was 35 weeks pregnant. Thankfully he was healthy and only required a few extra days beyond the norm in the hospital. I was so concerned about people touching him once we arrived home that if I could've put a plastic bubble around us, I would've. I made sure everyone washed their hands. I stocked up on 5 and 6 bottles at a time of Bath and Body Works Anti-Bacterial Hand Soap--I always had Warm Vanilla Sugar, White Tea with Ginger, Coconut Lime Verbena, and Black Raspberry Vanilla in rotation. I thought if we washed our hands often with this germ killing soap, that I could shield our family from ever getting sick. Reality set in and I really started researching these things more and more. I had already been using Burt's Bees on my body and goat's milk soap, but still thought that I needed that special germ fighting soap. After researching what exactly is in these anti-bacterial hand washes, we stopped using them probably 3 or 4 years ago. First of all, it is important to note that bacteria isn't horrible. There are actually good forms of it. What happens is that people get so worried about germs that they end up getting rid of healthy bacteria. 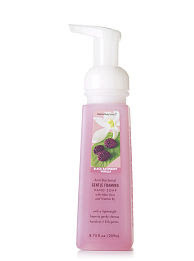 Triclosan is the active ingredient in anti-bacterial products, including these hand soaps. By the way, triclosan is a cholorphenol (a pesticide linked to cancer). While using this in an appropriate environment-say a hospital-may very well be necessary, it isn't if you live in a healthy home. You may have clean hands, but you may also be doing more harm than good. Studies have shown that there is an increased risk of allergies because of weakened immunity. "Super bugs" have become more prevalent, and because of unnecessary use of these products, diseases are becoming more resistant to antibiotics (as in the case of MRSA). Triclosan has also been shown to linger on the skin--in other words, you believe you're rinsing it down the drain, but it continues to sit on the skin and kill bacteria. What you end up with is a greater chance of becoming ill and resistant to treatment because you're healthy bacteria isn't there to fight the nasties. It's not just that--I have been reading more and more about triclosan. While there haven't yet been conclusive results and multiple studies, there is research being done with potential links between triclosan and autism because it interferes with myelination in the brain. This has prompted researchers to start studying a possible link between triclosan and Alzheimers. By the way, if you're a breastfeeding mom and use anti-bacterial products, the triclosan does get into the breastmilk. You cannot avoid triclosan altogether, though. While you can choose regular soap and water and non anti-bac hand washes (which the FDA says are equally as effective at getting rid of germs), triclosan is present in almost 70% of our rivers, lakes and streams. It is killing marine life and affecting our entire eco-system. Triclosan, by the way, is also present in many deodorants, some toothpastes (particularly the Colgate brand), and several mouth washes. Let's break the list down. I'm going to mention the best ingredients in this and the worst. The benign ones (like water and other harmless neither good nor bad items) I will pass over. Petrolatum-Vaseline--a semisolid mixture of mineral oil and waxes and comes from petroleum. You might thin, "Oh, Vaseline...it's been used forever." Well, petrolatum is banned in the EU and is linked to breast cancer. It's everywhere--in products we use on our kids, especially (look at Aquaphor's ingredients). Propylene Glycol-is used in conjunction with other chemical ingredients as a preservative. It is also found in products to make it easier for other added ingredients to penetrate the skin. This ingredient has been shown in studies to aggravate skin conditions such as eczema. This derivitave of mineral oil is considered a petrochemical. There are many different grades of PG: industrial grade is found in anti-freeze. Some will tell you that skin care products with propylene glycol just like anti-freeze. This isn't true--the kind in cosmetics is cosmetics grade. That being said, can cause contact dermatitis, especially in such a very high concentration. Remember that the active ingredient in this product is TRICLOSAN. That's worse than these 3 bad ones, in my opinion. Would I recommend Bath & Body Works Anti-Bacterial Hand Soap? Heck no. I don't care if they are buy 1, get 12 free next time there is a Semi Annual Sale (which I've skipped for a couple years anyway). The fact that they contain triclosan is enough to say no. The other ingredients alone make me want to run away from this. What is scary is that triclosan will stay on your child's hands...so if your child licks his hands, he is licking triclosan. Perhaps that is why there is such a warning on the bottles now to keep out of reach of children. Soap and water will do the trick. While I don't love all of the ingredients, Method (find it here at Target and Wegmans) offers a triclosan-free hand wash. I wash my hands with my liquid facial soap. I also have bars of soap in little wooden crates to use.